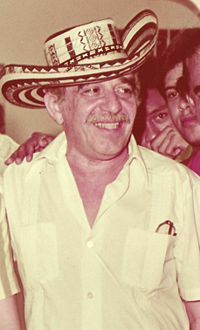 García Márquez during a visit to Valledupar, Colombia (c. 1984). novelist, short-story writer, and journalist. Gabriel José de la Concordia García Márquez ( March 6, 1927 - April 17, 2014) was a Colombian novelist, short-story writer, screenwriter and journalist. García Márquez, familiarly known as "Gabo" in his native country, is considered one of the most significant authors of the twentieth century. In 1982, he was awarded the Nobel Prize in Literature. He pursued a self-directed education that resulted in his leaving law school for a career in journalism. From early on, he showed no inhibitions in his criticism of Colombian and foreign politics. He started his career as a journalist, and wrote many acclaimed non-fiction works and short stories, but is best-known for his novels, such as One Hundred Years of Solitude (1967) and Love in the Time of Cholera (1985). His works have achieved significant critical acclaim and widespread commercial success, most notably for popularizing the literary style known as magic realism, which uses magical elements and events in order to explain real experiences. Some of his works are set in a fictional village called Macondo, and most of them express the theme of solitude. The effect of magic realism, the interjection of magical events, not explainable by modern science, is one which heightens the perspective of audiences by asking them to suspend disbelief and accept the possibility of the miraculous in the day to day tangible world. Such an affect is attractive to those who seek the underlying spiritual reality in the physical world, as well as to those for whom the natural world is nonetheless filled with mystery and potential of existence. Gabriel García Márquez was born on March 6, 1927 in the town of Aracataca, Colombia, to Gabriel Eligio García and Luisa Santiaga Márquez. Soon after García Márquez was born, his father became a pharmacist. In January 1929, his parents moved to Baranquilla while García Marquez stayed in Aracataca. He was raised by his maternal grandparents, Doña Tranquilina Iguarán and Colonel Nicolás Ricardo Márquez Mejía. When he was eight, his grandfather died, and he moved to his parents' home in Barranquilla where his father owned a pharmacy. Since García Márquez's parents were more or less strangers to him for the first few years of his life, his grandparents influenced his early development very strongly. His grandfather, who he called "Papalelo", was a Liberal veteran of the Thousand Days War. The Colonel was considered a hero by Colombian Liberals and was highly respected. He was well-known for his refusal to remain silent about the banana massacres that took place the year García Márquez was born. The Colonel, whom García Márquez has described as his "umbilical cord with history and reality," was also an excellent storyteller. He taught García Márquez lessons from the dictionary, took him to the circus each year, and was the first to introduce his grandson to ice–a "miracle" found at the United Fruit Company store. He would also occasionally tell his young grandson "You can't imagine how much a dead man weighs," reminding him that there was no greater burden than to have killed a man; a lesson that García Márquez would later integrate into his novels. García Márquez's political and ideological views were shaped by his grandfather's stories. In an interview, García Márquez told his friend Plinio Apuleyo Mendoza, "my grandfather the Colonel was a Liberal. My political ideas probably came from him to begin with because, instead of telling me fairy tales when I was young, he would regale me with horrifying accounts of the last civil war that free-thinkers and anti-clerics waged against the Conservative government." This influenced his political views and his literary technique so that "in the same way that his writing career initially took shape in conscious opposition to the Colombian literary status quo, García Márquez's socialist and anti-imperialist views are in principled opposition to the global status quo dominated by the United States." García Márquez's grandmother, Doña Tranquilina Iguarán Cotes, played an equally influential role in his upbringing. He was inspired by the way she "treated the extraordinary as something perfectly natural." The house was filled with stories of ghosts and premonitions, omens and portents, all of which were studiously ignored by her husband. According to García Márquez she was "the source of the magical, superstitious and supernatural view of reality." He enjoyed his grandmother's unique way of telling stories. No matter how fantastic or improbable her statements, she always delivered them as if they were the irrefutable truth. It was a deadpan style that, some 30 years later, heavily influenced her grandson's most popular novel, One Hundred Years of Solitude. In 1940, García Márquez left his family who had moved a year earlier to Sucre in order to begin his secondary school education at the Jesuit boarding school of San José in Barranquilla. At San José, he first published his words in the school magazine Juventud. On a visit to his parents in Sucre, he met Mercedes Barcha at a student dance, and knew right away that he intended to marry her when they were finished with their studies. In 1943, he was awarded a scholarship to attend the Liceo Nacional de Varones in Zipaquirá, a city thirty miles north of Bogotá. In an interview, García Márquez noted, "My literary background was basically in poetry, but bad poetry ... I started out with the poetry that appeared in grammar books. I realized that what I most liked was poetry and what I most hated was Spanish class, grammar." During this period García Márquez also read a wide variety of European classics in addition to Spanish and Colombian literature. If I had nothing to do and to avoid getting bored I'd hole up at the school library, where they had the Aldeana collection. I read the whole thing! ... From volume one to the last! I read El carnero, memoirs, reminiscences ... I read it all! Of course, when I reached my last year in secondary school, I knew more than the teacher did. After graduation in 1947, he started law school at the National University of Colombia in Bogotá. While in Bogotá, García Márquez took up a program of self-directed reading. Metamorphosis by Franz Kafka was one work which particularly inspired him. He was excited by the idea that one could write acceptable literature in an untraditional style that was so similar to his grandmother's stories which "inserted bizarre events into an ordinary setting and related those anomalies as if they were just another aspect of everyday life." He was now more eager to be a writer than before. Soon after, his first published story La tercera resignación appeared in the September 13, 1947 edition of the newspaper El Espectador. Although his passion was now writing, he continued in the law school in 1948 to please his father. During the Bogotá riots on April 9, 1948, the university closed indefinitely and his boarding house was burnt down , so García Márquez transferred to the University of Cartagena. By 1950, he gave up on the idea of becoming a lawyer to focus on journalism. He moved back to Barranquilla to write for the newspaper, El Heraldo. In his autobiography, he says: "I had left the university a year before with the rash hope that I could earn a living in journalism and literature without any need to learn them, inspired by a sentence I believe I had read in George Bernard Shaw, 'From a very early age I've had to interrupt my education to go to school.'" Although García Márquez never finished university, Columbia University in New York awarded him an honorary doctorate of letters in 1971. Since García Márquez had met Mercedes Barcha, they had been waiting to finish school in order to get married. When he was sent to Europe as a foreign correspondent, Mercedes waited for him to return to Barranquilla. They were finally wed in 1958. The following year, their first son, Rodrigo García, who became a television and film director, was born. In 1961, the family traveled by Greyhound bus throughout the southern United States and eventually settled in Mexico City. García Márquez had wanted to see the Southern United States because it had inspired the writings of William Faulkner. Three years later, the couple's second son, Gonzalo, was born in Mexico. Gonzalo became a graphic designer in Mexico City. Since García Márquez was 18, he had wanted to write a novel based on his grandparents' house where he grew up. However, he struggled with finding an appropriate tone and put off the idea until one day the answer hit him while driving his family to Acapulco. He turned the car around and the family returned home so he could begin writing. He sold his car so his family would have money to live on while he wrote, but writing the novel took far longer than he expected; he wrote every day for 18 months. His wife had to ask for food on credit from their butcher and their baker as well as nine months of rent on credit from their landlord. Fortunately, when the book was finally published in 1967 it became his most commercially successful novel, One Hundred Years of Solitude (Cien años de soledad) (1967; English translation by Gregory Rabassa 1970). García Márquez signing a copy of One Hundred Years of Solitude in Havana, Cuba. Also due to his newfound fame and his outspoken views on U.S. imperialism he was labeled as a subversive and for many years was denied visas by U.S. immigration authorities. However, after Bill Clinton was elected U.S. president, he finally lifted the travel ban and claimed that García Márquez's One Hundred Years of Solitude was his favorite novel. In 1999, García Márquez was diagnosed with lymphatic cancer. Chemotherapy provided by a hospital in Los Angeles proved to be successful, and the illness went into remission. This event prompted García Márquez to begin writing his memoirs: "I reduced relations with my friends to a minimum, disconnected the telephone, canceled the trips and all sorts of current and future plans," he told El Tiempo, the Colombian newspaper, "...and locked myself in to write every day without interruption." In 2002, three years later, he published Living to Tell the Tale (Vivir para Contarla), the first volume in a trilogy of memoirs. In 2000, his impending death was incorrectly reported by Peruvian daily newspaper La República. The next day other newspapers republished his alleged farewell poem, "La Marioneta" but shortly afterwards García Márquez denied being the author of the poem, which was determined to be the work of a Mexican ventriloquist. In April 2014, García Márquez was hospitalized in Mexico. He had infections in his lungs and his urinary tract, and was suffering from dehydration. He was responding well to antibiotics. Mexican president Enrique Peña Nieto wrote "I wish him a speedy recovery." Colombian president Juan Manuel Santos said his country was thinking of the author and said "All of Colombia wishes a speedy recovery to the greatest of all time: Gabriel García Márquez." García Márquez died of pneumonia at the age of 87 on April 17, 2014 in Mexico City. On hearing the news, the Colombian president Juan Manuel Santos mentioned: "One Hundred Years of Solitude and sadness for the death of the greatest Colombian of all time." The former Colombian president Álvaro Uribe Vélez said: "Master García Márquez, thanks forever, millions of people in the planet fell in love with our nation fascinated with your lines." García Márquez began his career as a journalist while studying law in university. In 1948 and 1949 he wrote for El Universal in Cartagena. Later, from 1950 until 1952, he wrote a "whimsical" column under the name of "Septimus" for the local paper El Heraldo in Barranquilla. García Márquez noted of his time at El Heraldo, "I'd write a piece and they'd pay me three pesos for it, and maybe an editorial for another three." During this time he became an active member of the informal group of writers and journalists known as the Barranquilla Group, an association that provided great motivation and inspiration for his literary career. He worked with inspirational figures such as Ramon Vinyes, who García Márquez depicted as an Old Catalan who owns a bookstore in One Hundred Years of Solitude. At this time, García Márquez was also introduced to the works of writers such as Virginia Woolf and William Faulkner. Faulkner's narrative techniques, historical themes and use of provincial locations influenced Latin American authors. The environment of Barranquilla gave García Márquez a world-class literary education and provided him with a unique perspective on Caribbean culture. From 1954 to 1955, García Márquez spent time in Bogotá and regularly wrote for Bogotá's El Espectador. He was a regular film critic, which drove his interest in film. Ending in controversy, his last domestically-written editorial for El Espectador was a series of 14 news articles in which he revealed the hidden story of how a Colombian Navy vessel's shipwreck "occurred because the boat contained a badly stowed cargo of contraband goods that broke loose on the deck." García Márquez compiled this story through interviews with a young sailor who survived the shipwreck. The publication of the articles resulted in public controversy, as they discredited the official account of the events, which had blamed a storm for the shipwreck and glorified the surviving sailor. In response to this controversy El Espectador sent García Márquez away to Europe to be a foreign correspondent. He wrote about his experiences for El Independiente which was later shut down by Colombian authorities. García Márquez's background in journalism provided a foundational base for his writing career. Literary critic Bell-Villada noted, "Owing to his hands on experiences in journalism, García Márquez is of all the great living authors the one who is closest to everyday reality." Leaf Storm (La Hojarasca), García Márquez's first novella, was published in 1955 after taking seven years to find a publisher. García Márquez notes that "of all that he had written (as of 1973), Leaf Storm was his favorite because he felt that it was the most sincere and spontaneous." All the events of the novel take place in one room, during a half-hour period on Wednesday September 12, 1928. It is the story of an old colonel (similar to García Márquez's own grandfather) who tries to give a proper Christian burial to an unpopular French doctor. The colonel is supported only by his daughter and grandson. The novel explores the child's first experience with death using a stream of consciousness technique. The book also uses the perspective of Isabel, the Colonel's daughter, to provide a feminine point of view as well. The story chronicles several generations of the Buendía family from the time they found the fictional South American village Macondo through their trials and tribulations. 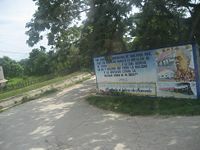 The history of Macondo is often generalized by critics to represent rural towns throughout Latin America or at least near García Márquez's native Aracataca. This novel was widely popular and led to García Márquez's Nobel Prize as well as the Rómulo Gallegos Prize in 1972. William Kennedy has called it "the first piece of literature since the Book of Genesis that should be required reading for the entire human race," and hundreds of articles and books of literary critique have been published in response to it. However, García Márquez himself does not completely understand the success of this particular book: "Most critics don't realize that a novel like One Hundred Years of Solitude is a bit of a joke, full of signals to close friends; and so, with some pre-ordained right to pontificate they take on the responsibility of decoding the book and risk making terrible fools of themselves." García Márquez was inspired to write a dictator novel when he witnessed the flight of Venezuelan dictator Marcos Pérez Jiménez. According to Marquez, "it was the first time we had seen a dictator fall in Latin America." García Márquez began writing Autumn of the Patriarch (El otoño del patriarca) in 1968 and said it was finished in 1971; however, he continued to embellish the dictator novel until 1975 when it was published in Spain. According to García Márquez, the novel is a "poem on the solitude of power," following the life of an eternal dictator known as the General. The novel is developed through a series of anecdotes related to the life of the General, which do not appear in chronological order. Although the exact location of the story is not pin-pointed in the novel, the imaginary country is situated somewhere in the Caribbean. After Autumn of the Patriarch was published the Garcia Marquez family moved from Barcelona to Mexico City. and García Márquez pledged not to publish again until the Chilean Dictator Augusto Pinochet was deposed. However, he ultimately published Chronicle of a Death Foretold while Pinochet was still in power as he "could not remain silent in the face of injustice and repression." Love in the Time of Cholera (El amor en los tiempos del cólera) was first published in 1985. It is a nontraditional love story as "lovers find love in their 'golden years'—in their seventies, when death is all around them". In 2002, García Márquez published the memoir Vivir para contarla, the first of a projected three-volume autobiography. Edith Grossman's English translation, Living to Tell the Tale, was published in November 2003. As of March 2008 his most recent novel is Memories of My Melancholy Whores (Memoria de mis putas tristes), a love story that follows the romance of a 90-year-old man and a pubescent concubine, that was published in October 2004. This book caused controversy in Iran, where it was banned after the initial 5,000 copies were printed and sold. In May 2008, despite the fact that García Márquez had earlier declared that he "had finished with writing," it was announced that the author was now finishing a new novel, "a novel of love" that had yet to be given a title, to be published by the end of the year. Critics often describe the language that García Márquez's imagination produces as visual or graphic, and he confides that each of his stories is inspired by "a visual image,". For this reason he has had a longstanding involvement with film. He is a film critic. He founded and served as executive director of the Film Institute in Havana, was the Head of the Latin American Film Foundation, and has written several screenplays. For his first script he worked with Carlos Fuentes on Juan Rulfo's El gallo de oro. His other screenplays include the films Tiempo de Morir (1966) and Un senor muy viejo con unas alas enormes (1988), as well as the television series Amores Difíciles (1991). García Márquez also originally wrote his Eréndira as a screenplay. However, this version was lost and replaced by the novella. Nonetheless, he worked on rewriting the script in collaboration with Ruy Guerra and the film was released in Mexico in 1983. Several of his stories have inspired other writers and directors. In 1987, the Italian director Francesco Rosi directed the movie Cronaca di una morte annunciata based on Chronicle of a Death Foretold. Several film adaptations have been made in Mexico, including Jaime Humberto Hermosillo's Maria de mi corazón (1979), and Arturo Ripstein's El coronel no tiene quien le escriba (1998). British director Mike Newell (Four Weddings and a Funeral) filmed Love in the Time of Cholera in Cartagena, Colombia, with the screenplay written by Ronald Harwood (The Pianist). The film was released in the United States on November 16, 2007. García Márquez is also noted for leaving out seemingly important details and events so the reader is forced into a more participatory role in the story development. For example, in No one writes to the colonel the main characters are not given names. This practice is influenced by Greek tragedies, such as Antigone and Oedipus Rex, in which important events occur off-stage and are left to the audience's imagination. García Márquez has said of his early works (with the exception of Leaf Storm), "Nobody Writes to the Colonel, In Evil Hour, and Big Mama's Funeral all reflect the reality of life in Colombia and this theme determines the rational structure of the books. I don't regret having written them, but they belong to a kind of premeditated literature that offers too static and exclusive a vision of reality." In his other works he has experimented more with less traditional approaches to reality, so that "the most frightful, the most unusual things are told with the deadpan expression". A commonly cited example is the physical and spiritual ascending into heaven of a character while she is hanging the laundry out to dry in One Hundred Years of Solitude. The style of these works fits in the "marvelous realm" described by the Cuban writer Alejo Carpentier and has been labeled as magical realism. Literary critic Michael Bell proposes an alternative understanding for García Márquez's style, as the category magic realism is criticized for being dichotimizing and exoticizing. Bell writes "what is really at stake is a psychological suppleness which is able to inhabit unsentimentally the daytime world while remaining open to the promptings of those domains which modern culture has, by its own inner logic, necessarily marginalized or repressed." García Márquez and his friend Plinio Apuleyo Mendoza discuss his work in a similar way, "'The way you treat reality in your books... has been called magical realism. I have the feeling your European readers are usually aware of the magic of your stories but fail to see the reality behind it...' 'This is surely because their rationalism prevents them seeing that reality isn't limited to the price of tomatoes and eggs.'" The theme of solitude runs through much of García Márquez's works. As Pelayo notes, "Love in the Time of Cholera, like all of Gabriel García Márquez's work, explores the solitude of the individual and of human kind...portrayed through the solitude of love and of being in love". In his Nobel Prize acceptance speech, "Solitude of Latin America"  he relates this theme of solitude to the Latin American experience, "The interpretation of our reality through patterns not our own, serves only to make us ever more unknown, ever less free, ever more solitary." Another important theme in many of García Márquez's work is the setting of the village he calls Macondo. He uses his hometown of Aracataca, Colombia as a geographical reference to create this imaginary town, but the representation of the village is not limited to this specific area. García Márquez shares, "Macondo is not so much a place as a state of mind." Even when his stories do not take place in Macondo, there is often still a consistent lack of specificity to the location. So while they are often set with "a Caribbean coastline and an Andean hinterland... [the settings are] otherwise unspecified, in accordance with García Márquez's evident attempt to capture a more general regional myth rather than give a specific political analysis." "This fictional town has become well known in the literary world. As Stavans notes of Macondo, "its geography and inhabitants constantly invoked by teachers, politicians, and tourdepictsist agents..." makes it "...hard to believe it is a sheer fabrication." In Leaf Storm García Márquez depicts the realities of the Banana Boom in Macondo, which include a period of great wealth during the presence of the United States companies and a period of depression upon the departure of the American banana companies. As well, Hundred Years of Solitude takes place in Macondo and tells the complete history of the fictional town from its founding to its doom. In several of García Márquez's works, including No one Writes to the Colonel, Evil Hour, and Leaf Storm he references la violencia (the violence), "a brutal civil war between conservatives and liberals that lasted into the 1960s, causing the deaths of several hundred thousand Colombians." Throughout all of his novels there are subtle references to la violencia; for example, characters living under various unjust situations like curfew, press censorship, and underground newspapers. Evil Hour, while not one of García Márquez's most famous novels is notable for its portrayal of la violencia with its "fragmented portrayal of social disintegration provoked by la violencia." Although García Márquez does portray the corrupt nature and the injustices of times like la violencia, he refuses to use his work as a platform for political propaganda. "For him, duty of the revolutionary writer is to write well, and the ideal novel is one that moves its reader by its political and social content, and, at the same time, by its power to penetrate reality and expose its other side." "García Márquez continues to cast a lengthy shadow in Colombia, Latin America, and the United States. Critical works on the 1982 Nobel laureate have reached industrial proportion and show no signs of abating. Moreover, García Márquez has galvanized Colombian literature in an unprecedented way by giving a tremendous impetus to Colombian literature. Indeed, he has become a touchstone for literature and criticism throughout the Americas as his work has created a certain attraction-repulsion among critics and writers while readers continue to devour new publications. No one can deny that García Márquez has helped rejuvenate, reformulate, and recontextualize literature and criticism in Colombia and the rest of Latin America." In 1982, García Márquez received the Nobel Prize in Literature "for his novels and short stories, in which the fantastic and the realistic are combined in a richly composed world of imagination, reflecting a continent's life and conflicts". His acceptance speech was entitled "Solitude of Latin America". García Márquez was the first Colombian and fourth Latin American to win a Nobel Prize for Literature. After becoming a Nobel laureate, García Márquez told a correspondent: "I have the impression that in giving me the prize they have taken into account the literature of the sub-continent and have awarded me as a way of awarding all of this literature." ↑ (Spanish) Vargas, Alejo. Gabriel García Márquez y la paz colombiana.. ElColombiano.com. Retrieved February 11, 2009. ↑ (Spanish) García Márquez media por la paz. BBC Mundo (2007-03-13). Retrieved February 11, 2009. ↑ García Márquez: "Lo que me mata es que crean que escribo así". Elsalvador.com. Retrieved February 11, 2009. ↑ (Spanish) García Márquez Farewell Letter. Museum of Hoaxes. Retrieved February 11, 2009. ↑ Elwyn Lopez, Literary giant Gabriel García Márquez hospitalized CNN, April 4, 2014. Retrieved April 238, 2014. ↑ Paloma Torres, Gabriel García Márquez Dies: Famed Colombian Author And Nobel Laureate Dead At 87 From Pneumonia Latin Times, April 17, 2014. Retrieved April 23, 2014. ↑ E. Eduardo Castillo and Frank Bajak, Garcia Marquez, Nobel Laureate, Dies at 87 Associated Press|, April 17, 2014. Retrieved April 23, 2014. ↑ 60.0 60.1 Author Gabriel Garcia Marquez dies BBC, April 17, 2014. Retrieved April 23, 2014. ↑ El adiós a Gabriel García Márquez en Twitter La Nación, April 17, 2014. Retrieved April 23, 2014. ↑ García Márquez. One Hundred Years of Solitude. Retrieved February 11, 2009. ↑ García Márquez. Autumn of the Patriarch. ↑ Sarkouhi, Faraj (2007-11-26). Iran: Book Censorship The Rule, Not The Exception. Payvands' Iran News. Retrieved February 11, 2009. ↑ Ron, Jesus (2007-12-04). Mayhem in Paris, author banned from Iran, Chavez at odds w/ Colombia & Spain. Rutgers Observer. Retrieved February 11, 2009. ↑ Keeley, Graham (2008=05-08). Magic triumphs over realism for García Márquez. The Guardian. Retrieved February 11, 2009. ↑ Aufderheide, Patricia. Cross-cultural film guide. American University Library. Retrieved February 11, 2009. ↑ "Solitude of Latin America", The Official Web Site of the Nobel Foundation . Retrieved February 1, 2009. ↑ Nobel Prize in Literature for 1982. Apuleyo Mendoza, Plinio & Gabriel García Márquez (1983), The Fragrance of Guava, London: Verso, ISBN 0860919652 . Bell, Michael (1993), Gabriel García Márquez: Solitude and Solidarity, Hampshire: Macmillan, ISBN 0333537653 . Bell-Villada, Gene H. (1990), García Márquez: The Man and His Work, North Carolina: University of North Carolina Press, ISBN 0807818755 . Bell-Villada, Gene H., ed. (2006), Conversations with Gabriel García Márquez, Jackson: University Press of Mississippi, ISBN 1578067847 . Bhalla, Alok, ed. (1987), García Márquez and Latin America, New Delhi: Sterling Publishers Private Limited, ISBN 9780938719083 . Bloom, Harold, ed. (2007), Gabriel García Márquez, New York: Chelsea House, ISBN 0791093123 . Cebrian, Juan Luis (1997), Retrato de Gabriel García Márquez, Gutenberg: Círculo de Lectores, ISBN 8422655721 . Douglas, Edward, Mike Newell on Love in the Time of Cholera. Retrieved 2008-08-18 . Esteban, Angel & Stephanie Panichelli (2004), Gabo Y Fidel: el paisaje de una amistad, Planeta Publishing, ISBN 9788467012637 . Forero, Juan (October 9, 2002), "A Storyteller Tells His Own Story; García Márquez, Fighting Cancer, Issues Memoirs", New York Times. Retrieved February 11, 2009 . García Márquez, Gabriel (1982), "Nobel lecture", in Frangsmyr, Tore, Nobel Lectures, Literature 1981–1990, Singapore: World Scientific Publishing Co., 1993 . Retrieved October 18, 2008. García Márquez, Gabriel (1968), No One Writes to the Colonel (1st ed. ), Harper & Row, ISBN 0060114177 . Gonzales, Nelly (1994), Bibliographic Guide to Gabriel García Márquez, 1986–1992, Oxford: Greenwood Publishing Group, ISBN 0313288321 . Kennedy, William (October 31, 1976), "A Stunning Portrait of a Monstrous Caribbean Tyrant", New York Times. Retrieved February 11, 2009 . McMurray, George R. (1987), Critical Essays on Gabriel García Márquez, Boston: G.K. Hall & Co., ISBN 0816188343 . Oberhelman, Harley D. (1995), García Márquez and Cuba: A Study of its Presence in his Fiction, Journalism, and Cinema, Fredericton: York Press Ltd., ISBN 0919966950 . Pelayo, Ruben (2001), Gabriel García Márquez: A Political Companion, Westport: Greenwood Press, ISBN 0313312605 . Simons, Marlise (December 5, 1982), "A Talk With Gabriel García Márquez", New York Times. Retrieved February 11, 2009 . Williams, Raymond L. (1984), Gabriel García Márquez, Boston: Twayne Publishers, ISBN 0805765972 . "Leaf Storm" • "No One Writes to the Colonel" • "Big Mama's Funeral" • "The Incredible and Sad Tale of Innocent Eréndira and Her Heartless Grandmother" • "Strange Pilgrims" • "A Very Old Man with Enormous Wings" • "For The Sake of A Country Within Reach Of The Children"
History of "Gabriel Garcia Marquez"
This page was last modified on 17 May 2017, at 16:38.